Citizen Science: Should I start an Interspecies Research Project? Have you ever heard or participated in a Citizen Science project? As part of my Interspecies Research between humans and plants, one of the tools I use is the Music of the Plants device developed at Damanhur Spiritual EcoCommunity, where I live. When we started working with plant music, we thought we would be listening in on the internal “thoughts” (for lack of a better word) of plants. Basically, we thought it would be a one-way, closed stream of communication. Boy were we wrong! People started reporting health benefits after listening to plant music. Less colds, lower rates of depression, more energy… reports arrived from within the community at first, since that was the only place you could find the device. And once the device became publicly available, the stories increased. Healers and medical professionals started to use the device in their practices, creating personalized protocols based on their areas of specialization. There has yet to be a formal research study on these effects. Individuals, such as Teresa Helgeson and Jean Thoby have carried out informal studies with a pre-determined protocol, and for this I am extremely grateful. So how can we get more research? Since last year, I have been working with a team of doctors and researchers to carry out the first formal study on the effects of plant music on human health. A research study is a very long process, and after a year of work, we have finalized the protocol and plan to enter the next phase—identifying study participants—later this year. Citizen Science, also known as community science, crowd science, crowd-sourced science, civic science, volunteer monitoring, or networked science, is scientific research conducted, in whole or in part, by amateur (or nonprofessional) scientists. 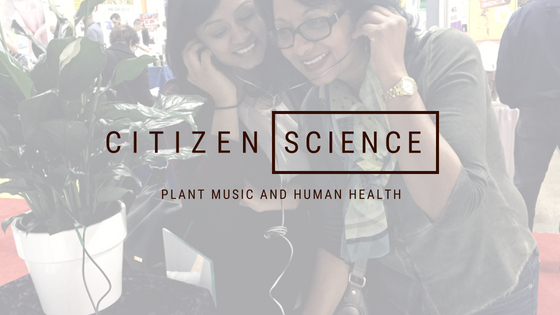 What if we were to put together a Citizen Science project to study the effects of plant music on human health? For it to work, we would need a big pool of participants. We know that there are enough devices out in the world to accomplish our goals, but do Music of the Plants owners want to participate? Will new people get devices to be a part of this ground-breaking study? Would you participate in a Plant Music Citizen Science project? If you are interested, let me know by filling out the form below. Do you have a Music of the Plants device? Thank you for your participation! The results will be published shortly.